These herbed-poached egg whites on wheat are an ideal low-calorie, high-protein breakfast. Poaching egg whites yield light, fluffy white clouds that are perfect atop a single slice of whole-grain toast. A bit of freshly chopped tarragon takes your egg whites from basic to savory. 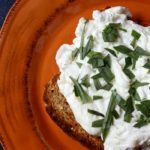 Make these herb-poached egg whites for a savory breakfast featuring fluffy poached egg whites, freshly chopped tarragon, and a single slice of whole-grain toast. Place egg whites into a small bowl. Hold bowl close to the water’s surface and slip the egg whites into the water; cook for about 3 to 4 minutes, or until whites are completely set. Gently lift egg whites out of water. Place egg whites on toast; sprinkle with tarragon.